-- Woody Guthrie, "Roll On Columbia"
NORTH BONNEVILLE -- Saturday's celebration of Bonneville Dam was as much a tribute to the Columbia River as it was to the structure that first harnessed it. But the ceremony marking the 75th anniversary of the dam's dedication included plenty of adoration for the landmark hydroelectric facility that helped reshape the Northwest's energy landscape. Perhaps none said it better than President Franklin D. Roosevelt himself -- depicted Saturday by impersonator Gary Stamm -- who spoke at the dedication of Bonneville Dam in 1937. "Truly in the construction of the dam," Roosevelt said, "we have had our eyes on the future of the nation." 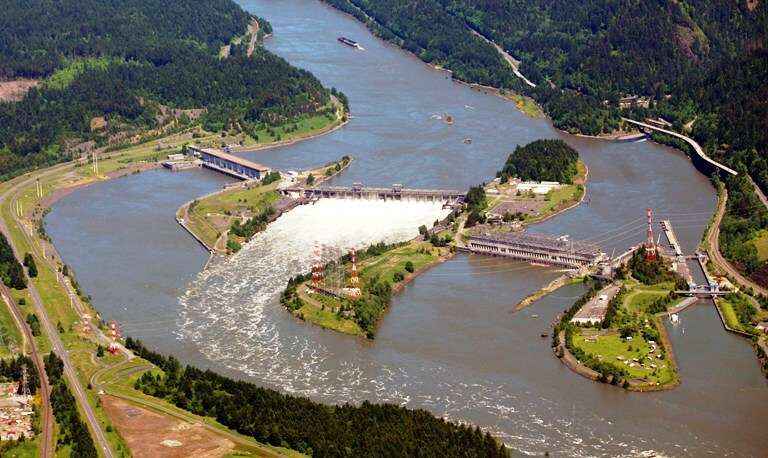 Bonneville Dam was the first of 31 federal dams built in the Columbia Basin, including 11 on the Columbia itself. Bonneville and Washington's Grand Coulee Dam were among the largest regional power sources to the massive war effort that took off shortly after their construction. The Bonneville Power Administration and U.S. Army Corps of Engineers, which operates Bonneville Dam, celebrated the facility and its history with an elaborate event Saturday. The gathering included federal executives, Native American tribal leaders, members of Congress, local officials and hundreds of American-flag-waving visitors. Honored guests arrived in a motorcade of 1930s-era cars. All spoke against the dramatic backdrop of the Columbia River Gorge, just outside a Bonneville Dam visitor center. BPA administrator Steve Wright, who will retire in January, called Bonneville and other dams an essential part of the Northwest's identity and history. Life in the region today would be "unrecognizable" without the facilities and the cheap, clean power they provide, he said. Of course, the arrival of hydroelectric facilities to the Columbia Basin was not celebrated by everyone. Wright noted the work the BPA and others are doing to restore fish populations decimated by dams and other changes on the Columbia, to "right the wrongs" of previous decades, he said. Yakama tribal leader Gerald Lewis mentioned the now-gone Celilo Falls fishing grounds. He described the historic native camps along the river that vanished after the dams arrived -- even as he noted the benefits they've provided. Save Our Wild Salmon, a conservation organization, released a statement before Saturday's event that criticized the BPA's track record on fish restoration. "While Bonneville celebrates," the group said, "the salmon are not." Among the visitors at the gathering were Vancouver residents Dan and Val Ogden. Dan Ogden, a teenager when Bonneville Dam was dedicated in 1937, said he doesn't have any particular memories of the dam from that time. But his research as a University of Chicago doctoral student in the 1940s brought him in close contact with the BPA and its mission, he said. Ogden went on to a career that included stops at the U.S. Department of Interior, the U.S. Department of Energy and the Public Power Council, among others. The BPA model as a federal power-marketing agency has served the region well and should continue, he said. "Electricity is a public resource that should be (distributed) for the public, by the public, at cost," Ogden said. "Roll on, Columbia," Wright said. "Roll on."